Lexicraft Ltd manufactures metal nameplates for product identification, rating plates, branding and promotional purposes. Materials include aluminum, stainless steel and brass. Data and graphics are permanent. Aluminum is anodized and anodically printed. Stainless Steel is chemically etched (engraved) and filled with paint to reproduce corporate images, Serial Numbers and Bar Codes. Panels fronts are fabricated in the requisited materials and legends are permanently applied with the same techniques. Engraved laminates which covers a variety of product names including the more common known Traffolyte are often used for labels, tags, signs or overlays which are in more extreme industrial environments. These are generally a rigid or semi rigid layered material where we mechanically engrave the top surface to expose a different coloured layer thus creating the required image or text. Engraved laminates are available in a wide variety of colours for the top layer and the centre layer allowing us to produce a wide range of labels, tags, signs and overlays to suit most client’s requirements. In addition to engraving laminates we can also engrave and rout aluminum plates and panels some of which may also be Anodized Aluminum with specific data or information. 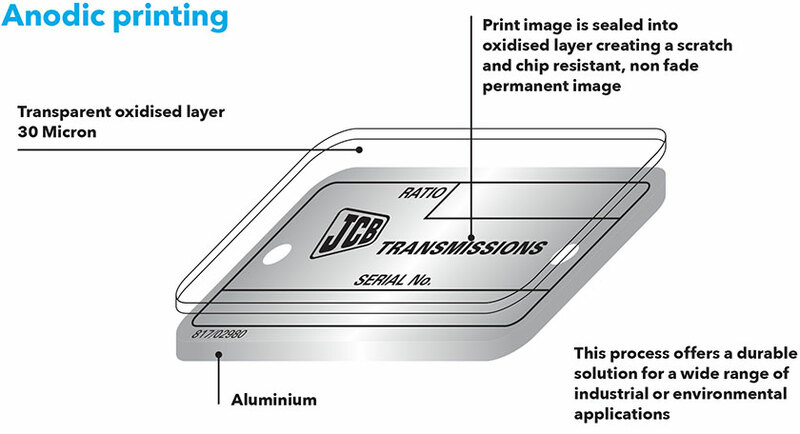 Chemical etching is a process where corrosive chemicals (acid) dissolve away part of the substrate which can be stainless steel or brass to produce the desired text or image. The chemical etching process begins by printing a reverse image to protect the areas which don’t want to be exposed to the acid and then running the metal through a curtain of acid to etch the un-protected areas. The numbers of runs and speed the metal is exposed to dictates the depth of the etching from a flash etch through to a deep etch. After etching, the printed protection is then removed and where applicable the etched area is filled with paint/ink or left with no infill which is more commonly known as a “natural etch” VIN, Chassis and marker plates are generally chemically etched although this process can be used on more aesthetic and detailed products as a very fine detail can be achieved. Anodized Aluminum is a process of opening the pores of the aluminum, printing and then sealing the aluminum meaning the print is effectively in the aluminum and not on the surface. This is achieved by exposing the aluminum to an electrical circuit which makes the surface porous which can then be printed with specialist inks. Once printed the aluminum is then sealed which creates a hard transparent surface and encapsulates the ink. This process is used for aluminum plates and overlay which are exposed to the elements or extreme environments such as vehicle, machinery or equipment marker plates.